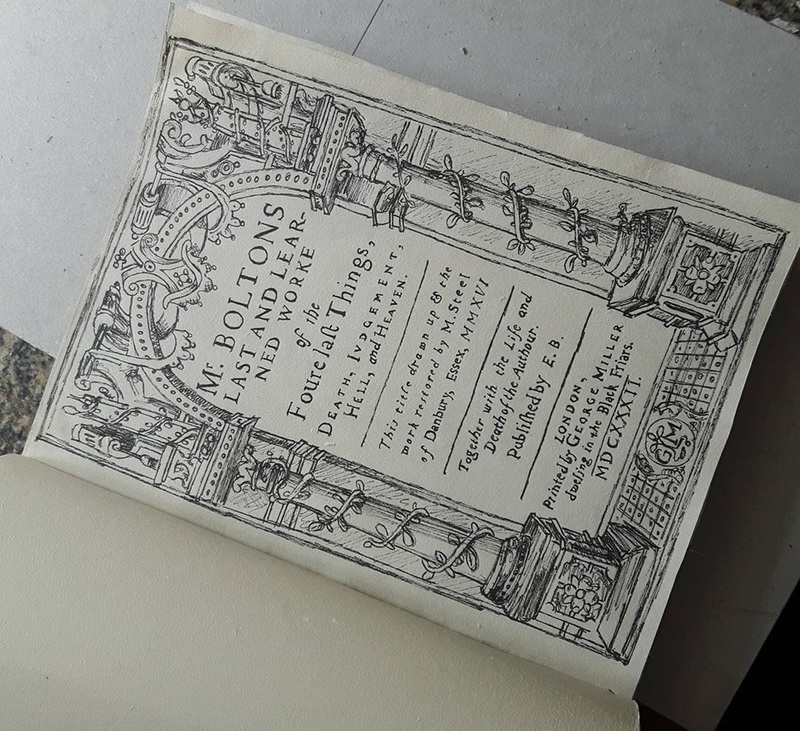 I’ve been restoring a small early 17th century work over the last few weeks – a volume of Robert Bolton’s Last Learned Work that I’d bought a little while back in a fairly ruined state. 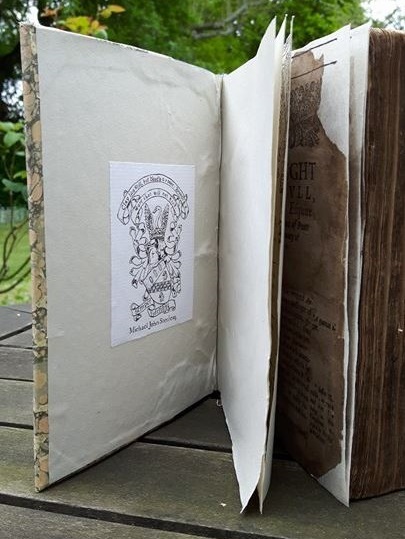 It was lacking the title page and, even though it was sold to me with ‘only one other page missing beyond that’, it turned out that a couple of other pages within the book had vanished over the last four hundred years too. Aside from various tears to several pages, the boards were missing and the spine had only the barest remnant of a covering. Allow me, then, to blog a little about it! 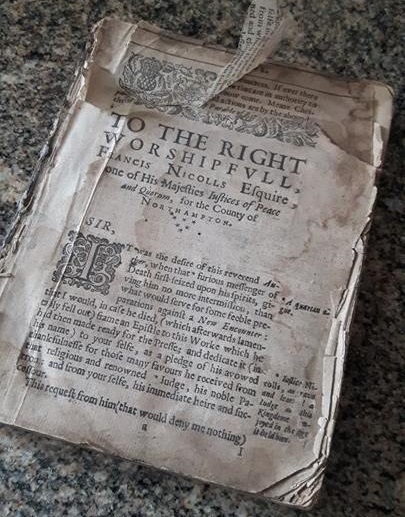 The damaged book as it looked when it arrived – the top tear was actually across the entire page, but some fellow antiquarian had in some years passed glued the inner corner to the page behind it. 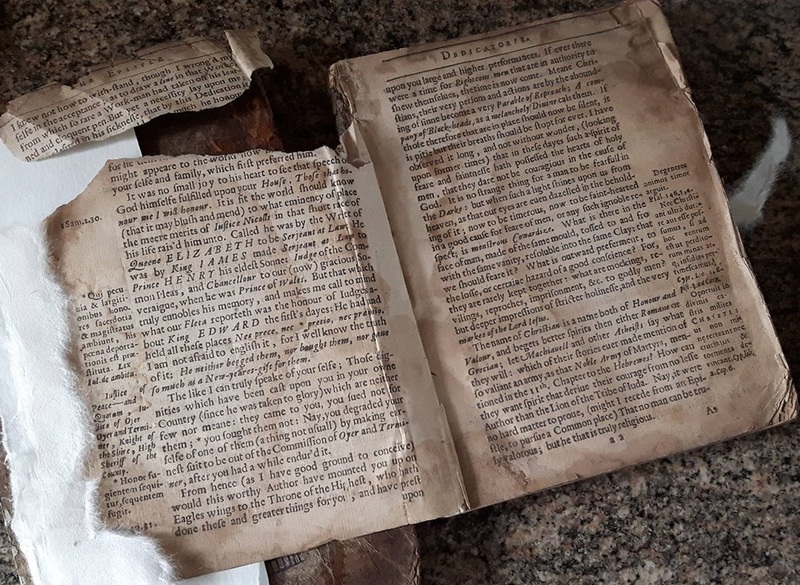 The first job was to undo the few remains of repairs that would obstruct the reconstruction of the book – namely the separation of the top of the first page that was glued to the page behind it, and then remove some later covering material from the spine. Once that was done I went through each page that needed repair and added repair paper – this involved pasting the repair paper over each tear and pressing the page repairs until dry, then removing them from the press and trimming the new paper. With the paper trimmed, I used one of my artist pens to go over some areas of printing that were missing because they were either obscured by the over-lap of the repair paper, or the original paper had been lost. 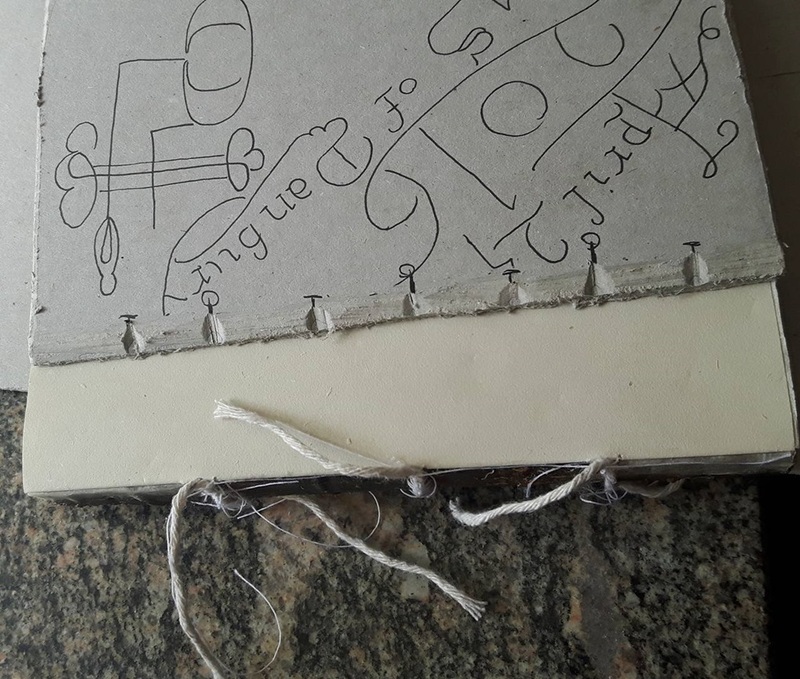 The next job was to sew some new bands into the spine to make it a bit more structurally sound – I always find this the dullest part of binding a book! The book now needed some end papers – Cockerell, that master of all things book-binding recommends end papers to only be added when the binding is finished; personally I’ve never been able to get that quite right, so this is the point that I personally find it easiest to add papers to the book. 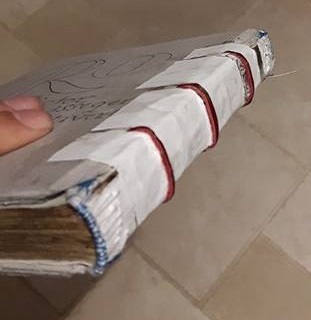 Next up was shaping the boards – I’d sewn three bands onto the book but was tempted to add fake bands and in fact have seven bands across the book in the final binding – judge as you will, dear Reader, I decided against that in the end. 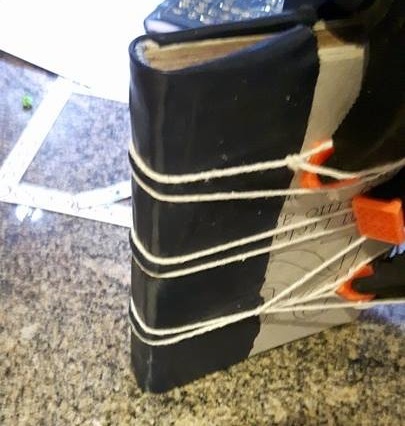 Once that was done I made the holes in the boards and sewed in the header and footer bands (a new skill only just added to my amateur book-binder’s repertoire), the boards could then be attached and at last the old volume started to look more like a book once more! Then to the leather! 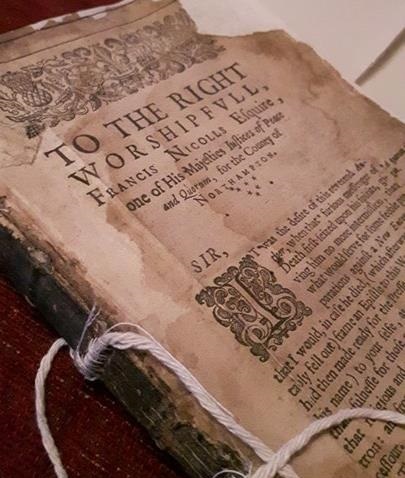 I’ve got a wonderful piece of blue leather that I am loathed to use on any piece of work – for a book as old as this I thought it had earned my best piece of leather for it’s binding. Still, I was mean enough with the amount of leather I was willing to use that I decided on a half binding. 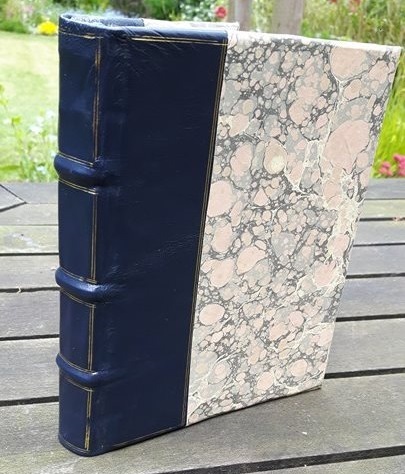 Once the leather was on and tidied up, I added the marbled paper to the boards and gilding on the spine panels: At last, a finished book! And there we have it – adieu, Happy Reader! While it is the second-newest of the main gates to the city, Aldersgate is still of a very ancient foundation, being built toward the end of the fourth century. It was possibly near the site of an earlier gate that was a part of the same Roman fort as Cripplegate. It is unclear if Aldersgate is a continuation of this gate, or a new gate built on a different site, if it is considered to be the former then it does in fact deserve to be in the above section. The gate may be first mentioned in the Laws of Ethelred in about the year 1000, when it is called the gate of Ealdred, however this could also apply to Aldgate, or even another minor London gate now unknown to history. 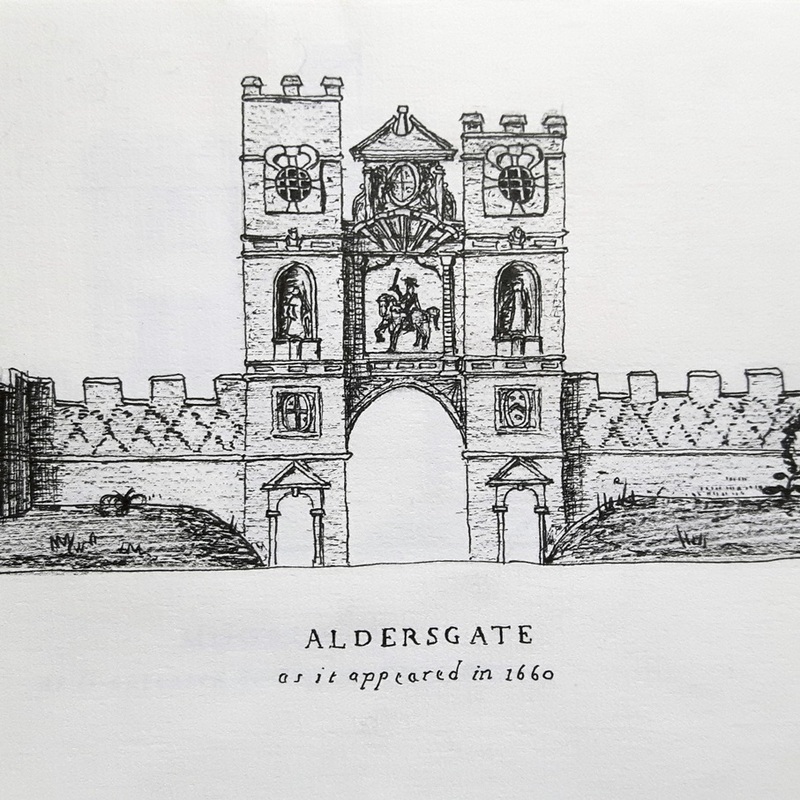 I think, though, that it is likely to refer to this gate, since in a Patent Roll of February 1270 a gate is referred to as Aldredesgate after Aldgate has already had its name well established as Aldgate for some years. 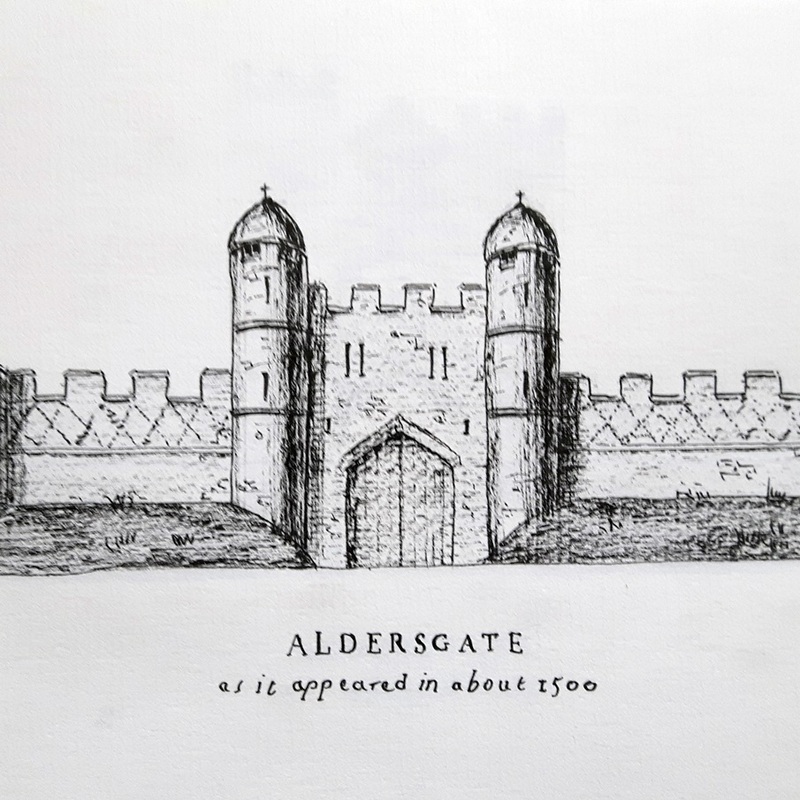 Aldersgate is firmly established as the name at least by the 1300s, although no records survive of any repairs or construction occurring to the gate. James I, the first of that blessed line of England’s monarchs, passed under the gate when he entered the city as its king before his formal coronation in 1603, not long after which an equestrian relief of the king was added to the outside of the gate. It was rebuilt in an elegant style in 1617, the relief of James being added onto this gate as well. Aside from this relief of the king, the gate also sported statues of a second image of James enthroned, and images of the prophets Samuel and Jeremiah. The use of the rooms over the gate are unclear throughout its medieval life, but it was leased for commercial purposes in the 17th century and was a printing office for some of that century, later becoming the residence of the city’s Cryer. Several buildings put against it at this time added considerable load to the gate, and were in the end pulled down shortly before the Great Fire. It was damaged in this fire but was restored in 1670, finally being pulled down in 1761. Allow me to cure your confusion with a little more blogging on some gates. The final gate I shall touch upon in my list of Roman gates is Cripplegate, which in my opinion must have been the oldest gate to survive in modern times – originating as part of the defences of the original Roman fort at London a little after AD100. Being quite distant from the heart of Saxon London, the gate appears to have had a quiet Saxon history. It was supposedly the site of a miracle in 1010, when Bury St. Edmunds was under threat of being sacked by the Danes and the body of the saint for which that town is named was transferred to London for reburial. 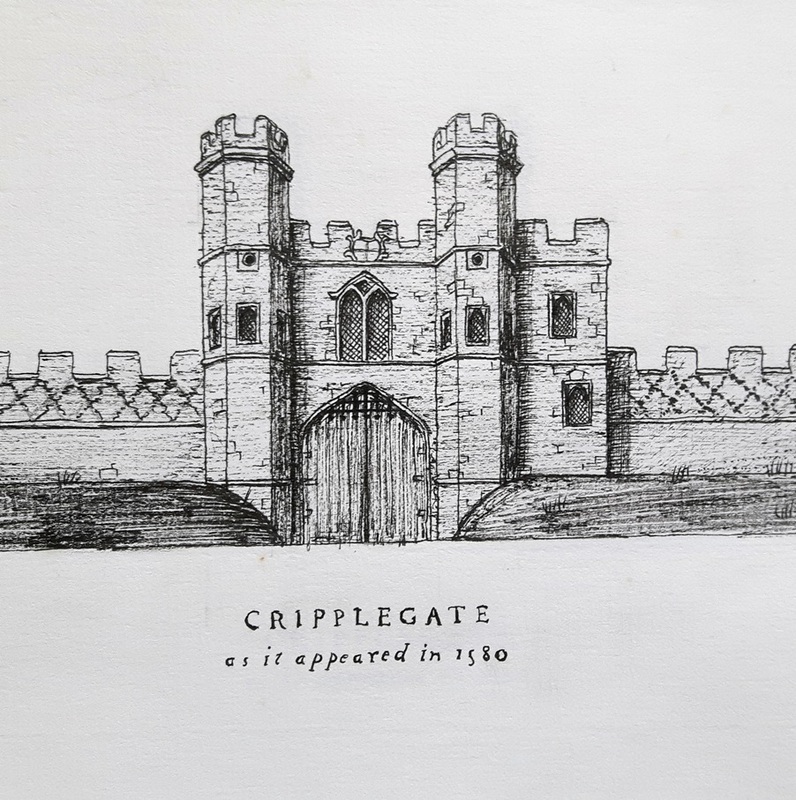 When passing through Cripplegate many sick people were apparently cured, and the gate itself was renowned for being a blessed place where sick people could go to be cured. 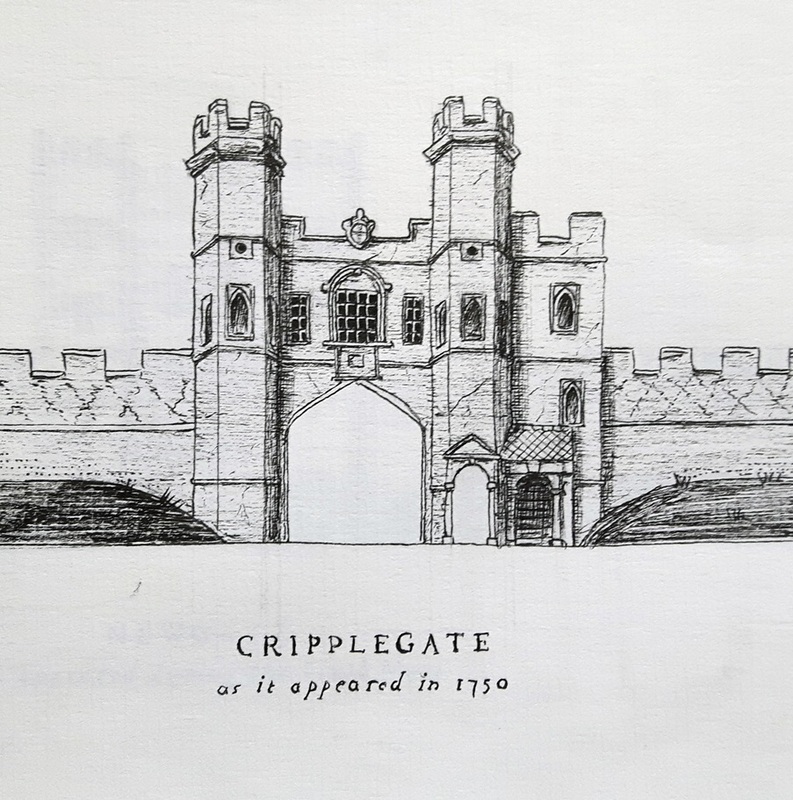 The origin of the name though doesn’t appear to stem from this occurrence, but instead possibly derives from the Saxon name Crepelgate, meaning a covered entrance or pathway. The Brewers Company of London paid for it to be rebuilt in 1244. It was rebuilt again in 1491 after money was bequeathed for the purpose by Edmund Shaw, a goldsmith. Similar to other gates, its medieval purpose was often that of a prison, but occasionally was set aside as a residence or for other official purposes. It survived the great fire of 1666 and the structure was improved in 1663 – when a foot gate was added – and apparently again in 1675, although what these second improvements were I cannot find. At this time the City Water Bailiff had use of the structure for his own residence. It survived another century, before meeting the same fate as the other gates of the city in 1760. Much as my following post needs a further read through to make sure I have definitely finished it to as full and excellent a quality as the never-ending maw of the internet demands, allow me to suggest that by finding human error in yourself, accept human error in this happy post, that I present now. In Roman times the western side of the city was guarded, besides the great Roman wall, by the Fleet River – now long covered over. Although the tattered remnant of that rive r is recalled as a narrow 19th century open sewer, its form that the Romans saw was wide enough that it acted as a natural harbour off of the Thames, and Ludgate was built at a part where it was narrow enough to build a bridge across. The road it guarded was not as major as other entrances, but without the gate was a significant graveyard that served the city. Medieval legend supposes that in the mid-7th century an image of the mighty Caedwalla, king of the Britons, was hung from the gate to warn away Saxons, although since London was under Saxon control at that time it makes the tale doubtful. Another ancient legend of this gate was spread by that meddler in British history, Geoffrey of Monmouth, is that the name of the gate derives from its founder – King Lud – who was supposedly also laid to rest not far from it. Lud is an apparently completely mythical figure, and doesn’t feature in any sensible chronology of the city, which leads me on to the true etymology of Ludgate. Some suppose it to come from the Saxon word for back gate, though it appears to have been a relatively important gate in Saxon times. A more likely supposition is it is a corruption of Fleetgate or Floodgate, referring to the river that it was built agaist. 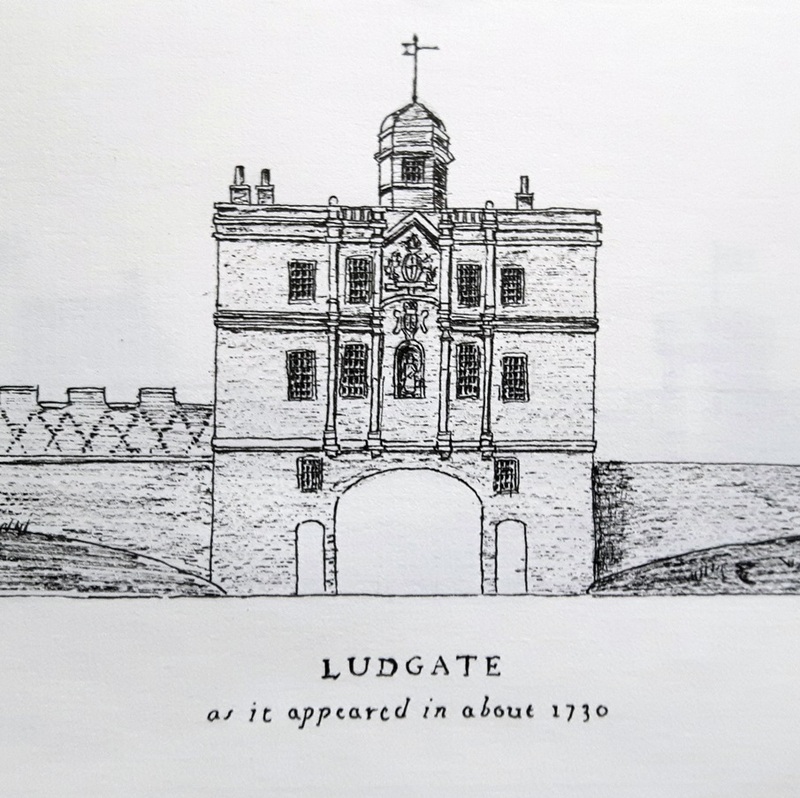 At the time of the Norman conquest Ludgate was the principal gate to the city and William the Conqueror intended to besiege the city with an attack being prepared for Ludgate itself. Fortunately, several important men of the city saw the futility of their cause and opened the gates, making Ludgate the first place that Norman forces entered London. The gate was rebuilt in about 1215, when it appears that many of the gates in London were in disrepair, and was by this time in use as a prison for debtors and other criminals; repairs were possibly carried out again in 1260. In 1378 the worst of these prisoners were moved out and more important people as well as members of the clergy who had committed crimes were incarcerated there. By 1431 the prison officers were in trouble, since the reasonable nature of the prison meant that many debtors were happy to stay there rather than pay their money and return to poverty. 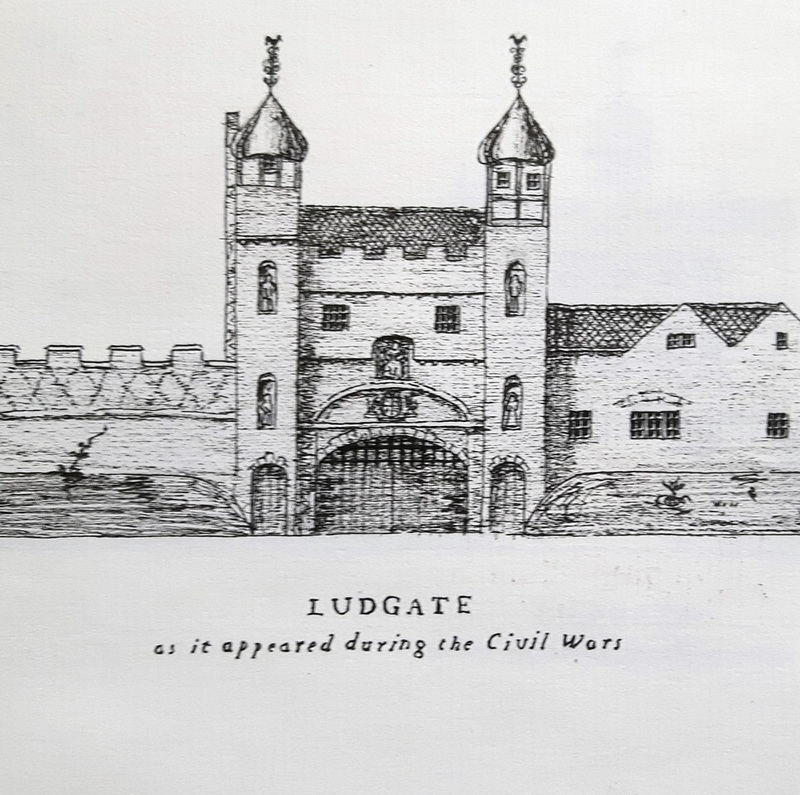 They were briefly moved to Newgate to try and encourage them to pay their fines and leave prison, which simply resulted in enough complaints from important prisoners that they were quickly returned to Ludgate. (This may have occurred once before with similar results in 1419.) Stephen Foster was imprisoned there in the first half of the 1400s and, after paying his debts, became eminent enough to pay for the reconstruction of the gate. Agnes Forster had a hand in rebuilding some of Ludgate prison in the 1460s after her husband had died, and was allowed therefore to adorn the gate with her and her husband’s coat of arms, as well as some verses to commemorate the two of them. The verses weren’t particularly good and, when the gate was next rebuilt, while the coat of arms was recovered and re-added to the new gate, the stone on which the verses were inscribed was turned around, and on the other side a simpler inscription was made before being added to the gate instead. This next rebuilding occurred in 1586, when the gate was adorned with statues of both King Lud and Queen Elizabeth I. The Earl of Essex came against the gate after his uprising of 1601, trying to escape the city, but found it closed to him and his retinue. Stoutly defending it was a militia of pikemen led by Richard Bancroft, Bishop of London; while several of Essex’s men including Sir Christopher Blunt were wounded or killed, the Earl himself narrowly escaped, having had a pike thrust through his hat. This gate survived for 80 years, when it was destroyed by the great fire of 1666 and rebuilt yet again in a handsome manner. Finally, the gate was removed in 1760 and the last few prisoners distributed elsewhere.